1 COMBINE ground beef with 1 Tbsp. Hellmann's® or Best Foods® Real Mayonnaise in bowl. Shape into 4 patties. 2 GRILL or broil until done. 3 SPREAD bun bottoms with remaining Mayonnaise. 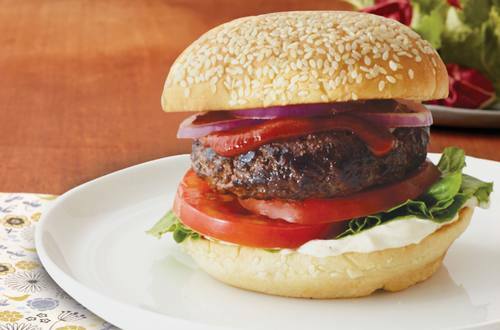 Top with greens, tomatoes, hamburgers, Hellmann’s® or Best Foods® REAL Ketchup, onions and bun tops.